We all know the health benefits of eating fresh fruit and there's nothing nicer than being able to pick your own fruit from the garden. It will also taste much better than supermarket produce! Whatever the size of your garden it's very easy to grow your own fruit trees and plants, even on your patio or balcony. These dwarf patio fruit trees have been grafted on to a dwarfing rootstock to restrict their overall size (this doesn't affect fruit size).Take a look at our range of dwarf fruit trees for sale to choose one for your own garden. 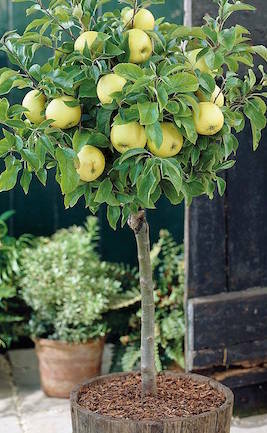 These easy to grow fruit trees are ideal for smaller gardens. When growing dwarf fruit trees on the patio, you need a reasonable size container to grow them in - at least 30cm (12in) diameter. Fill your container with a soil based compost such as John Innes No. 3 as this will add stability to your container and won't dry out as quickly as multi-purpose compost. Plant miniature fruit trees at the same soil level as they were in their original pots and water in thoroughly. A south facing aspect is preferable for growing fruit trees and produces the most abundant crop. Plum trees, peaches and nectarines all flower early in the spring so ideally their blossoms need protecting from frost by throwing fleece over the tree at night or bringing it under cover. Remember to leave access for pollinating insects during the day. When growing fruit trees in pots you will need to feed your patio fruit tree with a balanced fertiliser during spring and summer to replace nutrients used up from the compost. After flowering and during fruit swell, feed your container fruit trees with a high potash feed every 2 weeks. Make sure the compost doesn't dry out in hot weather as this may be detrimental to fruit production. After 2 years, remove your fruit tree from its container and comb out as much soil as possible from the root ball using a hand fork. Trim the roots back and replant the tree back into its original container with fresh John Innes No. 3 compost. Pruning isn't as difficult as you might think! Prune your patio fruit tree if there are any damaged or diseased shoots, or any that are crossing (as these may rub together and encourage disease). Sweet cherries, plums and peaches need little or no pruning. If you do wish to lightly prune them to keep their shape, then do this in the summer to minimise the risk of silver leaf disease. When you prune shoots, always cut to just above a bud or where the shoot joins a main branch. Apple and pear trees in containers will need pruning each summer to encourage fruit buds. Prune all the new season's growth back to 2 or 3 leaves. In the winter, check your tree hasn't become crowded with fruiting spurs (short branches covered with fat fruit buds) - if there is heavy congestion then they will need thinning out to continue producing quality fruit. In July, if your patio fruit trees have a very heavy crop of fruit it is worth thinning them to get better quality fruits and prevent stressing the tree. Aim for each fruit to be spaced 5-8cm apart. Blueberries can be expensive from the supermarket but are very easy to grow at home! Choose a container of at least 30cm (12in) diameter and fill it with a mixture of ericaceous compost (compost for acid-loving plants) and soil based compost such as John Innes No.3. Plant the blueberry plant at its original soil level and water it in thoroughly. Place the container in a sunny position for the best crops, although make sure the compost stays moist. Blueberries need acid soil so water your blueberry bush with rainwater rather than tap water. Feed your blueberry bush throughout the growing season with a special ericaceous plant food. New blueberry bushes don't need pruning for 2 or 3 years. Only prune out any weak or wayward horizontal shoots in the winter, cutting to just above a bud or where the shoot joins the branch. On established bushes prune out the oldest wood (4 year old growth) during winter, at the base of the plant, to encourage new stems to grow. Even raspberries can be grown in containers on the patio as long as the container is of a reasonable size - about 60cm (24in) diameter. Use John Innes No.3 compost and plant 6 raspberry canes around the edge of the container. As with all patio fruit make sure the compost doesn't dry out and feed your raspberries regularly with a high potash fertiliser throughout the growing season to encourage lots of delicious fruit. If your raspberry plants are summer-fruiting then cut the fruited canes down to the base after they have finished cropping. Leave the new green canes as these will provide next year's fruit. If your raspberry plants are autumn-fruiting then cut all the stems back to the base in February to stimulate new growth for the coming autumn. After 3 years plant the raspberry canes out in the garden. Buy patio fruit trees at Van Meuwen - learn more on our dwarf fruit trees page.